“Early life experience influences stress reactivity and mental health through effects on cognitive-emotional functions that are, in part, linked to gene expression in the dorsal and ventral hippocampus. The hippocampal dentate gyrus (DG) is a major site for experience-dependent plasticity associated with sustained transcriptional alterations, potentially mediated by epigenetic modifications. The study thoroughly investigated several areas. I’ll quote a few parts with the section heading. “Environmental enrichment promotes hippocampal neurogenesis – hippocampal volume is enlarged in mice raised in an enriched environment (EE) compared with standard housing (SH) in both the dorsal and ventral poles. EE also associates with >60% more newborn neurons. Specialization of gene expression in dorsal and ventral DG – Gene expression was more affected by EE in dorsal than ventral DG, and dorsal DG has twice as many differentially-expressed genes. DNA methylation differences between dorsal and ventral DG – Each of the three forms of methylation [CpG, non-CpG, and hmC (hydroxymethylation)] exhibited a distinct genomic distribution in dorsal and ventral DG. A key advantage of whole-genome DNA methylation profiling is the ability to identify differentially methylated regions (DMRs), often far from any gene body, that mark tissue-specific gene regulatory elements. This strong bias, with ~40-fold more hypomethylated regions in the dorsal DG, contrasts with the balanced number of differentially expressed genes in dorsal and ventral DG, suggesting an asymmetric role for DNA methylation in region-specific gene regulation. Despite their small number, ventral hypomethylated DMRs marked key developmental patterning transcription factors..which are linked to the proliferation, maintenance and survival of neural stem cells. “a The cell stages occurring within the subgranular zone of the dentate gyrus are shown together with a schematic illustration of possible relative proportions consistent with our data. 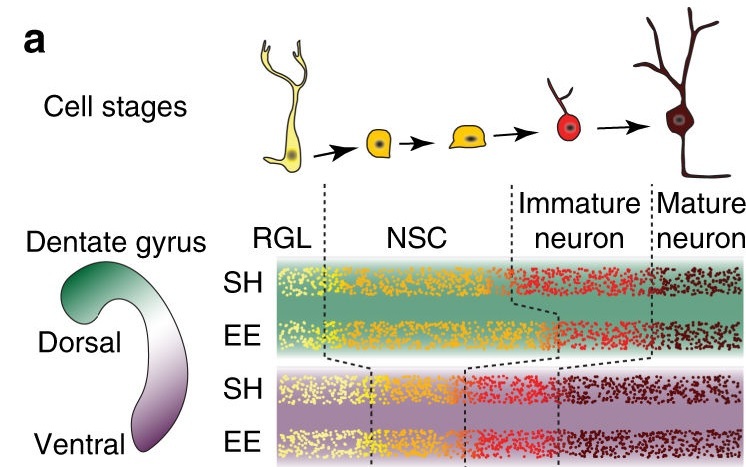 RGL Radial glia-like progenitor, NSC Neural stem cell. b Key genes associated with the RGL stage are up-regulated in ventral DG relative to dorsal DG. Why do human brain studies that include the hippocampus overwhelmingly ignore its role in our emotions? For example, the researchers of Advance science by including emotion in research could find only 397 suitable studies performed over 22 years from 1990 to 2011. There were tens or hundreds of times more human brain studies done during the same period that intentionally excluded emotional content! The current study provided physiological bases for dialing back the bias of human brain research focusing exclusively on cognitive functions without also investigating attributes of emotional processing. I look forward to seeing 2018 human studies that are designed to correct this recurring research deficiency.